One of the most common reasons garage doors malfunction is due to a broken garage door spring. These springs play an important role in opening and closing a garage door. They counteract the force of gravity on a door. In essence, these springs make it easy to lift a door — an otherwise heavy object. Without the springs, garages doors will not open or close as easily. The average garage door spring will last an average of 10,000 cycles if maintained regularly. After extended use, these springs can become worn, damaged, and more susceptible to breaking, potentially resulting in costly damages and repairs. Garages doors come in all types of shapes, sizes, and styles. Different doors require different garage door spring sizes. To ensure the door is balanced properly. Improper garage door spring installation can cause the door to malfunction and cause larger issues for the entire garage door system. 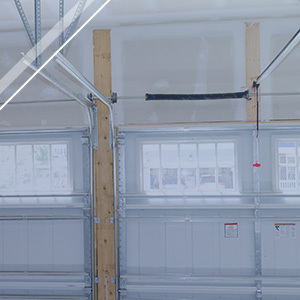 At RTS All American Garage Doors, we take great care in ensuring that the right garage door springs are properly installed on our customer’s garage doors. Whether you need a repair or a garage door spring replacement in Pensacola and the surrounding areas, the team at RTS All American Garage Doors is here to help educate you on the best options for your garage door. Most garages are equipped with two types of springs: extension and torsion springs. Depending on the size and type of a garage door, the sizes of these springs can vary but they are both designed to handle the weight of garage doors. These springs can be found installed on the sides of the garage door, running parallel to the track. These springs expand and contract as the door opens and closes. Extension spring installation generally involves the installation of the accompanying components and parts, such as safety cables. The springs lift the door with assistance from the pulley system. These springs can usually be found mounted above the garage door and help gain more control over the opening and closing of the garage door. Using torque to lift the weight, the spring slowly rotates and contains applied force in its tight coil rather than stretching and compressing lengthwise to open and close the door. These springs generally require less maintenance and help the door operate at a steady pace. While most garage door springs have a life expectancy of seven to nine years. However, the actual lifespan of the springs depends on how much the door is used as well as maintained. If your springs are nearing their expectancy, be on the look of these signs that indicate its time for repair or replacement. A broken garage door spring can be difficult and dangerous to repair and should be left to a professional. The team at RTS All American Garage Doors has the knowledge, experience, and professional equipment needed for garage door spring replacement and repair. No matter what the issue, you trust RTS for garage door services in Pensacola. Schedule an appointment or safety inspection today!